Not all readers of the blog will be able to see this, but if you live in the United Kingdom or can otherwise figure out how to access BBC Player, you can see the son of Geoffrey Lawrence, who was the presiding judge at the Nuremberg trial, on – get ready for this – Antiques Road Show. It starts at about 25 minutes. Antiques Road Show normally interviews people who have an old Chinese vase in their attic, and they come to learn that it is worth 20 grand or that it is worthless. Lawrence’s son came with three scrapbooks that were kept by his mother during the trial. They include many original snapshots, including family photos, and a collection of sketches of the defendants made by the Soviet prosecutor Nikotchenko. Lawrence fils said he found Nikotchenko to be quite charming. He was a boy of about 17 at the time, and spent his summer vacation in 1946 at Nuremberg. He describes attending some of the hearings. Judging by appearances, he is certainly the son of Geoffrey Lawrence. Besides the three scrapbooks, Lawrence produced the British flag that flew in the courtroom. We were told that these materials are available to the public at the Galleries ofJustice Museum, in Nottingham. The interviewer suggested the value might be 30,000 pounds, but said that was a meaningless number, and the real value was the contribution that the Nuremberg trial made to the modern world. Stéphane Hessel in the Nuremberg courtroom, November 2008. Stéphane Hessel died early today at the age of 95. He was one of France’s great human rights advocates. Amongst his contributions was work on the Universal Declaration of Human Rights. Very recently, he published a book, Indignez-vous!, which has been extraordinarily influential. I first met Stéphane Hessel when he was a member of the French Commission nationale consultative des droits de l’homme, perhaps 15 years ago. 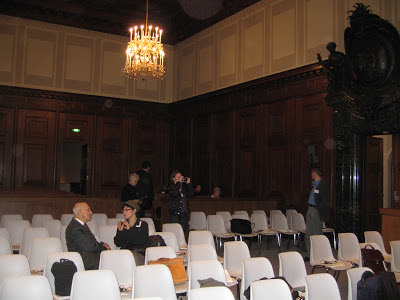 We were panellists at a conference on genocide held in Nuremberg in 2008 (see photo). And we met again some months ago in New York where he was a member of the Russell Tribunal on Palestine. Hessel was born in Berlin. His family moved to France in 1925 and he subsequently became a French citizen. The rather unconventional family arrangement of his parents was the basis of Truffault’s great film Jules et Jim. He was arrested by the Gestapo and sent to concentration camps, but somehow managed to escape and was rescued by American troops at the end of the war. Hessel became a diplomat and participated in the drafting of the Universal Declaration of Human Rights. He was a tremendously inspiring person. There will be many obituaries with more details on his life than I can provide. He always seemed incredibly youthful and energetic, even at 95. I remember him taking time at the 2008 conference to meet with Germany schoolchildren and talk to them (in German) about the importance of the Nuremberg trial. Middlesex University is opening some new positions in the School of Law. For more information, click here. In particular, there are some openings as Lecturer in Law and Research Fellow in Law. These are good opportunities for younger academics at a dynamic and growing institution located in one of the world's greatest cities. Judge Aspegren invites your comments: l.aspegren@swipnet.se . Senegal is now proceeding with plans to prosecute former Chadian tyrant Hissène Habré, who has enjoyed a form of asylum in Senegal for more than two decades. Last week, the text of the ‘Statut des Chambres africaines extraordinaires’ was released. It provides for the establishment of something that must be without precedent in the annals of international criminal law and, indeed, in the annals of law: a national tribunal created by one State with exclusive jurisdiction over acts perpetrated in another State. Article 1 of the Statut says that its purpose is to implement the decision of the African Union concerning prosecution by Senegal of international crimes perpetrated in Chad between 7 June 1982 and 1 December 1990 in accordance with Senegal’s international obligations. A relevant fact, but one not cited in the law, is the decision by the International Court of Justice last July finding Senegal to have breached its international obligations by failing to prosecute Habré. Article 2 establishes the ‘Chambres africaines extraordinaires’ within the courts of Senegal and article 3 says: ‘The Chambres africaines extraordinaires are empowered to prosecute and judge the principal perpetrators of crimes and serious violations of international law, of international custom and of international treaties ratified by Chad, committed on the territory of Chad during the period from 7 June 1982 to 1 December 1990. The Chambres have jurisdiction over genocide, crimes against humanity war crimes and torture. As is often the case in national legislation providing for prosecution of international crimes, the definitions are somewhat idiosyncratic. For example, whereas article 2 of the 1948 Genocide Convention lists ‘meurtre de membres du groupe’ (‘killing members of the group’) as the first punishable act of genocide, the Senegalese legislation uses the words ‘l’homicide volontaire de membres du groupe’. Actually, the Senegalese version may be an improvement on the French version of the Convention. It is certainly closer to the English text. The definition of crimes against humanity has its own unique feature. In contrast with genocide, where a treaty-based definition dating to 1948 was applicable to Chad in the 1980s, the only comparable treaty-based definition of crimes against humanity in the 1980s is found in article VI of the Charter of the International Military Tribunal (the Nuremberg tribunal). The Senegalese legislation proposes a concept of crimes against humanity with a contextual element that refers to ‘a widespread or systematic attack directed against any civilian population’, language that appears in article 7 of the 1998 Rome Statute. It proceeds to list the punishable acts in a rather original form, with the first category clearly drawn from the sexual violence provisions of the Rome Statute. It proceeds by listing ‘homicide involontaire’ (killing), whereas the Rome Statute says ‘meurtre’ (murder). The final act in the list is quite novel and does not seem to have any precedent: ‘g) la torture ou les actes inhumains causant intentionnellement de grandes souffrances ou des atteintes graves à l’intégrité physique ou à la santé physique et psychique inspirées par des motifs d’ordre politique, racial, national, ethnique, culturel, religieux ou sexiste’ (torture or inhuman acts intentionally causing great suffering or serious attacks on physical integrity or physical or mental health for political, racial, national, ethnic, cultural, religious or sexist motives). The Chambres are international not only by virtue of the crimes that they prosecute but also because of the involvement of the President of the Commission of the African Union in the appointment of judges and at least one of the judges is to be a national of another African State. The Human Rights Watch website has a very useful FAQ section about the new court. Although Habré’s name is not mentioned in the Statute, he will be the main defendant, if not the only one. An interesting issue of immunity arises, given that Habré is being prosecuted for acts perpetrated while he was head of State of Chad. When Pinochet was arrested in London in 1998, the House of Lords held that he did not enjoy immunity from prosecution for torture. However, this finding was reversed by the International Court of Justice in the 2002 Yerodia case. In principle, according to the International Court of Justice, a national court may not judge the head of state or even the former head of state, even for international crimes. The famous paragraph 61 of the Yerodia decision sets out exceptions to this general rule, of which the second is: ‘Secondly, they will cease to enjoy immunity from foreign jurisdiction if the State which they represent or have represented decides to waive that immunity.’ That is what seems to have happened. In fact, in para. 20 of last July’s ruling the International Court of Justice noting a letter dated 7 October 2002 from the Minister of Justice of Chad saying ‘that the Sovereign National Conference, held in N’Djamena from 15 January to 7 April 1993, had officially lifted from the former President all immunity from legal process’. Habré’s lawyers may argue that the immunity is a personal defence, but there is much authority for the view that the immunity belongs to Chad, not Habré, and that Chad can waive it if that is what it wants. One of Britain’s great anti-war poets, Siegfried Sassoon (1886-1967), published these lines in 1918 in his book Counter-Attack. A newly discovered draft of the poem indicates that he had to tone them down at the request of his publisher, Heinemann. The original draft included the words ‘you're great at murder’ and ‘gulp their blood in ghoulish dreams’. Sassoon received the Military Cross but threw it into the Mersey. From left, Elvira Dominguez, myself, Cathal Doyle, Alexandra Xanthaki and Maureen Spencer. Cathal Doyle successfully defended his doctoral thesis entitled 'Indigenous Peoples, Title to Territory, Rights and Resources: The Transformative Role of Free Prior and Informed Consent' on 31 January at Middlesex University. The external examiner was Dr. Alexandra Xanthaki and I was the internal examiner. 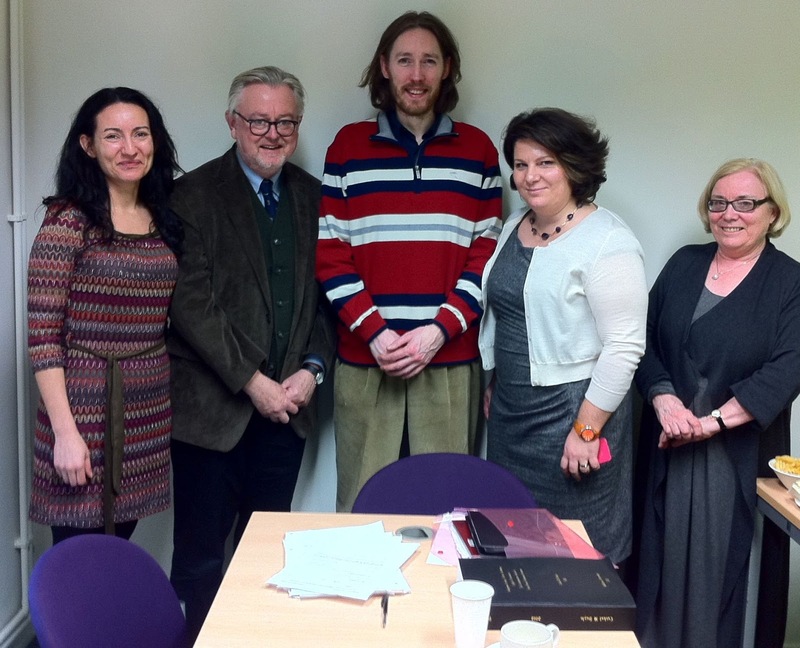 Cathal's thesis was supervised by Prof. Joshua Castellino and Dr. Elvira Dominguez.